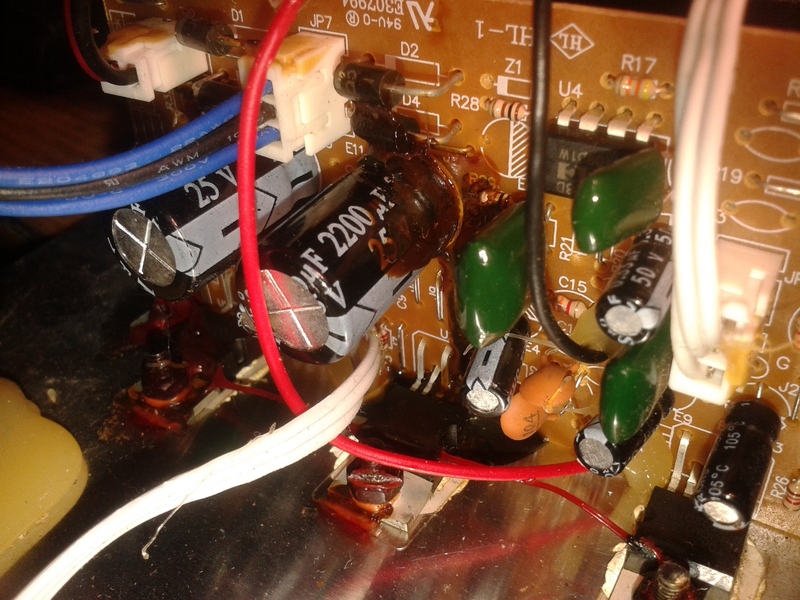 I tried Googling a blown capacitor but didn't find anything like this, so is that cap broken or is that brown goo something else. I also found out in some video that blown caps only affect the volume of speakers not their quality. the one on the left beside c 10 is a resistor if it not this one point it out with a pen . 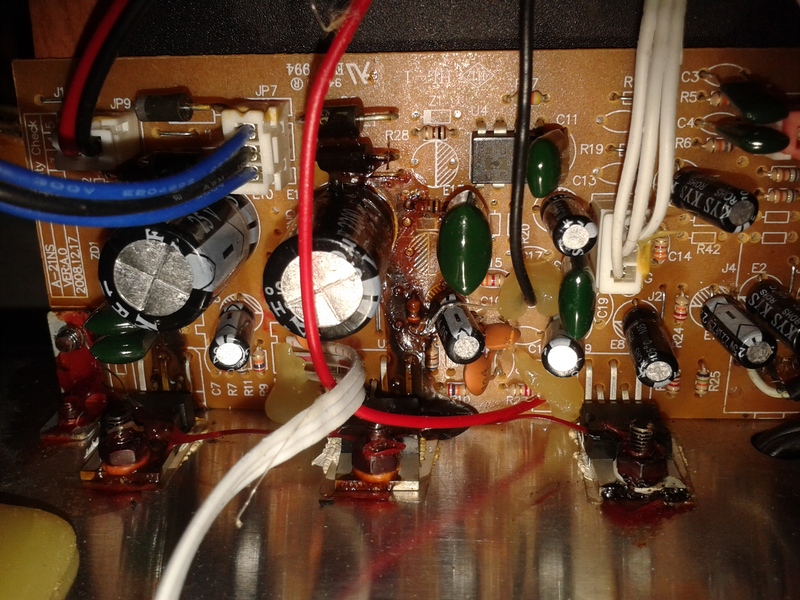 Capacitor(s) blown and then some by the looks of it all. That's the one, but can it (if it's broken) change the quality of the sound or just the volume? And is there by any chance a site that just has tons and tons of schematics for various electronics? It would be pretty handy. 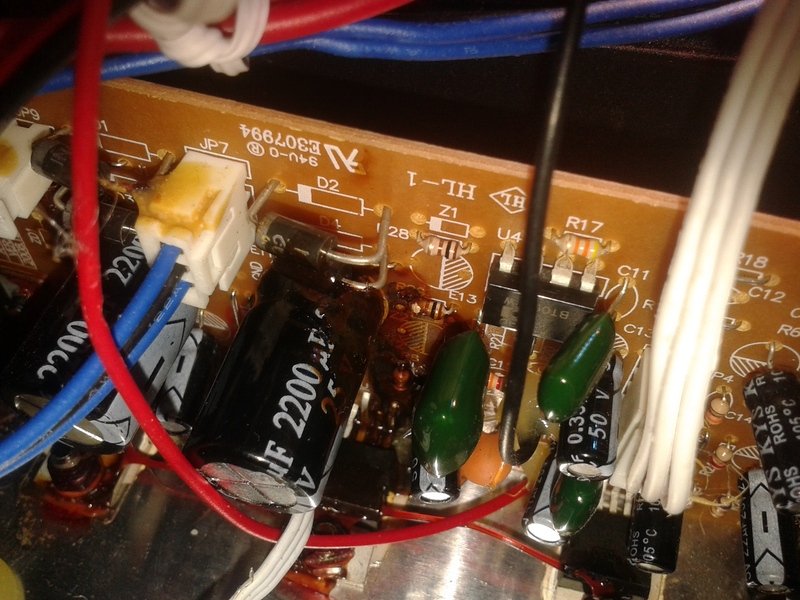 Myself and a few other electronics engineers have looked at this pic and we aren't convinced this is a blown capacitor. We think it may be just some sort of goop that wound up there. Although we can't see the capacitor from different angles like you can. Do you see the case on the capacitor broken with perhaps some leakage at all or does it look intact (even at the bottom). Also....How old are those speakers? As far as sound quality....it depends where the cap is in the circuit. Caps can be used for filters and in that case it would affect the sound quality. Caps can be used for other things as well that would not affect sound quality. Also....if you really want to know if it's the cap....you could desolder and and check it with a meter....but at that point....I would just replace it with a new one anyway. 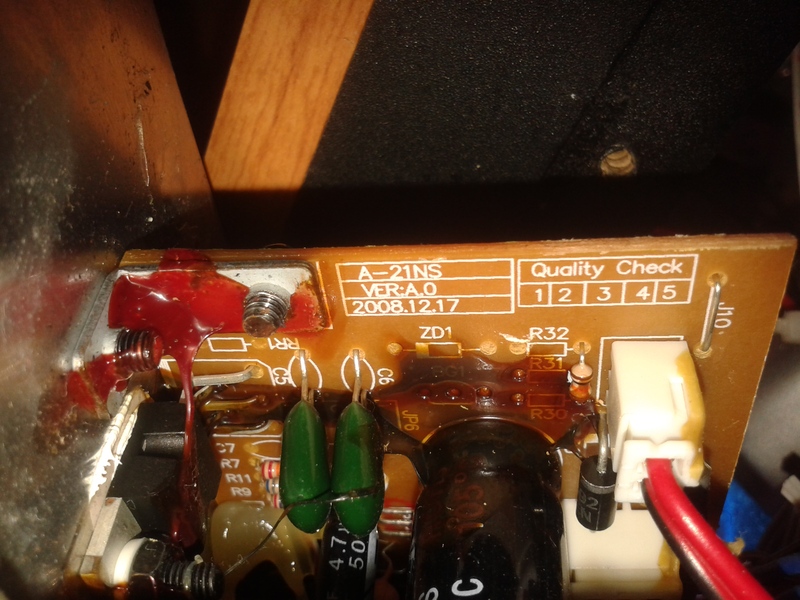 Here are some more pictures if that'll help, that capacitor is in the center of that whole goop so I suspect that it has leaked. The second photo probably has the correct date on it, I can't really remember when I got them. If it helps they are Genius SW-HF2.1 1200. Also that transistor's bands are Brown-Black-Brown-Gold which is 100 Ohms 5%. So I replaced the capacitor and it sounds a lot better, but I still can hear some static in the background. Could it be caused by the leaked fluid?